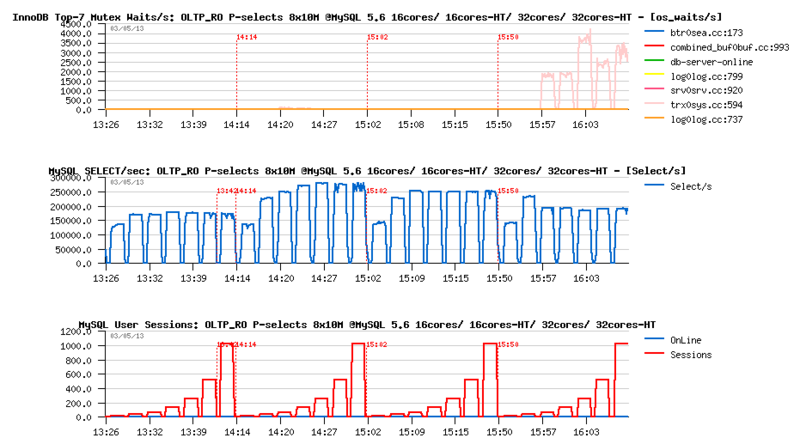 MySQL Performance: Why Performance Schema Overhead?.. As there was a lot of complain recently about various cases with PERFORMANCE SCHEMA (PFS) overhead, I've decided to start a series of articles to help you to use PFS in the best way to analyze your workloads. This is the first part, starting with an overview of instrumentation problems generally..
First of all, instrumentation cannot be free! - when you want to trace or get some stats about your application internals you're adding a new code, and this code is increasing an overall code path, so your final binary simply cannot run on the same speed by definition!.. Of course, if your instrumentation code is poor, the overall overhead will be bigger ;-) but if you're designing it well, it'll be lower, but still not zero!.. Dynamic instrumentation brings additional cost - as soon as you're willing to add some advanced stuff within your instrumentation, it makes sense to not keep it active all of the time.. - but checking of all these flag/states on active/inactive will bring additional cost as will require more additional code to manage it.. (the best realization for today of dynamic instrumentation will probably attributed to DTrace, but currently you cannot get it yet available on most of platforms, and which is remaining a story on itself)..
Instrumentation overhead is directly depending on event frequency - sounds trivial, right? - more frequently your instrumentation code is executed - bigger overhead you may expect. So, before you activate any instrumentations on some execution levels of your code you have to think about a frequency of events on this level.. BTW, exactly the same problem you're meeting with DTrace as well (for ex. see my old article with example of x10 slowdown under DTrace). However, when we're adding instrumentation into our own code, we may then keep in mind what kind of level of event frequency to expect within each part of code, and make and overhead of such an instrumentation predictable(!).. All this sounds simple.. - until we're not starting to feel an overhead directly related to involved instrumentation ;-) To give you a feeling of what it could be I wrote a simple "dumb code" of a program which is not doing anything useful, but just looping to keep CPU warm, and within it loops checking different conditions ;-) (the full source code you may find here if you want to play with it too). 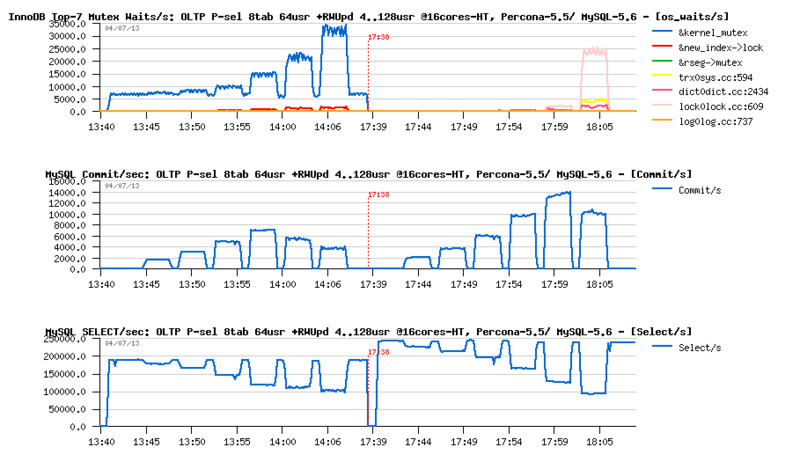 and then according to enabled instrumentation of each level, I'm then executing or not the instrumentation code on such a level (for TIMED instrumentation I'm using gettimeofday() which is probably not the most optimal, but good for an example)..
one "without PFS enabled" and namedd "pfs_loop-noPFS"
another with "PFS enabled" (PFS_DEF defined) and named "pfs_loop-withPFS"
Instr1 - 1/0 : enabled/disabled instrumentation on the "level1"
Timed1 - 1/0 : enabled/disabled TIMED instrumentation on the "level1"
So far, in the following example I'm executing the "pfs_loop" program with 4 levels in total, on the first 3 levels the program will run 1000 times in the "work loop" (N), and then will 500 times call execution of the next level. And only on the last (4th) level the "work loop" will be shorter - 10 times only (similar like you read few rows from FS cache, etc.).. Now exactly the same thing, but with binary compiled with "PFS instrumentation", but PFS is "disabled"
real    0m4.551s <-- 4% more..
real    0m4.685s <-- 6.6% more..
real    0m4.685s  <-- same 6.6% for "level 1"
real    0m4.700s <-- 7.3% for "level 2"
real    0m12.864s  <-- 293% for "level 3"
As you can see, more in "lower level" we're involving instrumentation - bigger overhead we're getting (trivial, right? - on a more lower level the same instrumentation code is executed way more often, so as the result the impact is more bigger too)..
at any time you may disable everything! while, "not compiled" -vs- "compiled, but disabled" (noPFS -vs- PFS=off) is "near" the same - only 2% overhead max here..
and all this dynamic, without MySQL Server restart! 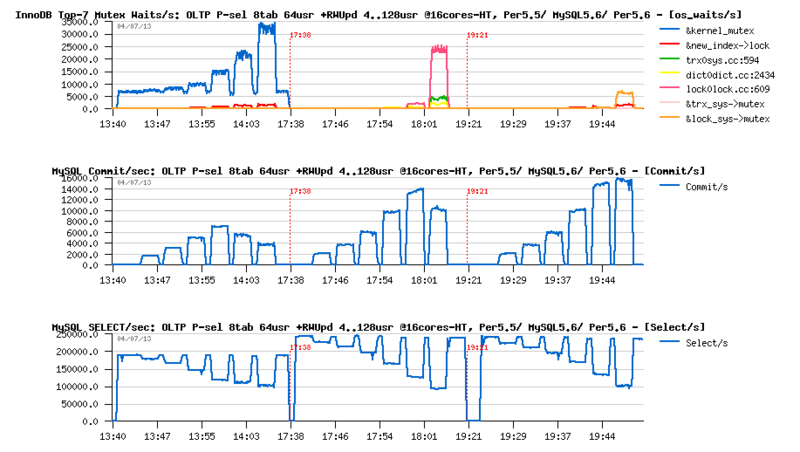 there are the same max 8% overhead -vs- noPFS.. - so, there is no instrumentation without cost, right?.. 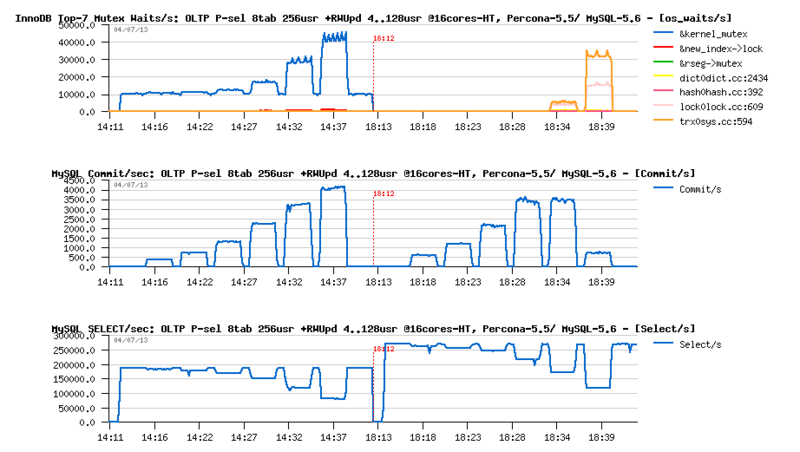 while PFS=def is not only have table stats, but also query digest..
and PFS instrumentation you may dynamically reduce at any moment, while the Facebook code is just here..
in fact, yes, MySQL 5.6 max QPS with PFS=off is higher than on Percona 5.6..
Instrumentation of higher frequency events having a bigger overhead! So, first of all I'll cover points exchanged within various discussions and blog comments. One of them was a tested database volume -- from my observations until now as soon as workload is read-only, and all used data set in tests is seating in Buffer Pool, and workload queries are not dependent on the data volume - then there will be near no difference from the benchmark results on a bigger or a smaller volume.. And Sysbench POINT-SELECT is a very good example here (as every query is just reading a single row by its PK). So, on my previous tests I've used x8 tables of 1M rows. Now I'll replay the same, but with 10M rows (so, x10 time bigger volume, and filling pretty well my 32GB BP). 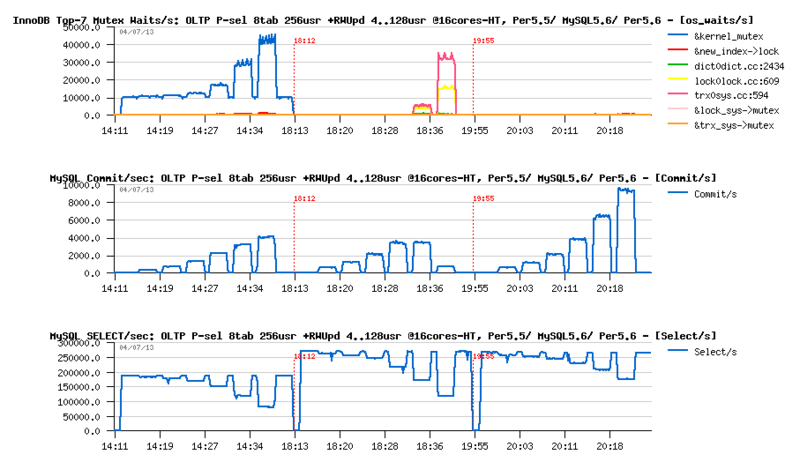 main bottleneck is on the kernel_mutex contention - interesting that this contention is most seen on configs with HT enabled..
performance is lower on 32cores, and then hitting again the trx_sys mutex contention on 32cores-HT..
so, even if READ-ONLY TRANSACTIONS feature is working well, it hits its limits anyway, and the code needs yet to be improved..
and since 128 concurrent user sessions the QPS level may only decrease (with increase of trx_sys mutex contention)..
the "TRX list" patch from Percona is resisting better for Percona-5.5 QPS, while also hitting a regression.. (but not as big as 5.6, and keep better on a high concurrency level)..
however, seeing regression on Percona-5.5 as well, making me thing that the story is not only about trx_sys contention here..
Well, the next 5.7 code is already auto-discovering READ-ONLY TRANSACTIONS even transaction statements are used, so even in this "non optimal" case there will be no regression (except that CPU time is wasted by transaction statement itself) -- so the question is then only to back port it to 5.6 code or not.. But Alexey is rising a more interesting question: what will be impact on RO transactions if in parallel there will be running a RW workload?.. Because the RO transaction feature is working well just because the "TRX list" is remaining empty.. - what will change for RO users when there will be some active transactions?.. 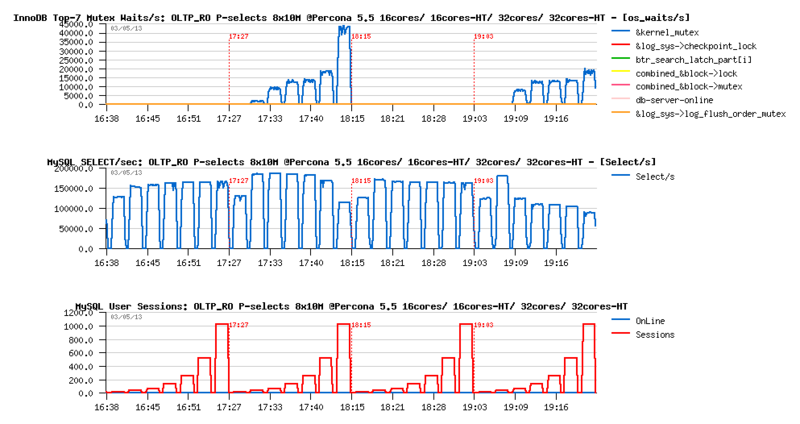 Let's start with 64 concurrent users in OLTP_RO (Percona-5.5 is on the left, MySQL-5.6 on the right). 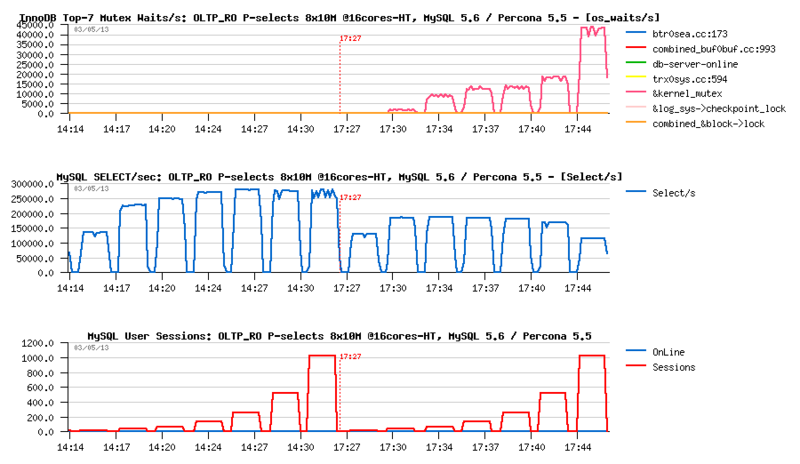 So, initially both engines are doing only RO workload and starting from their top levels on 64 users: 185K QPS for Percona-5.5, and 245K QPS for MySQL-5.6..
then the first 4 RW users arriving, then more and more up to 128..
as you can see, regression is impacting both engines..
and at the end of the test both are regressing on RO up to 100K QPS..
and MySQL-5.6 is still looking better here.. 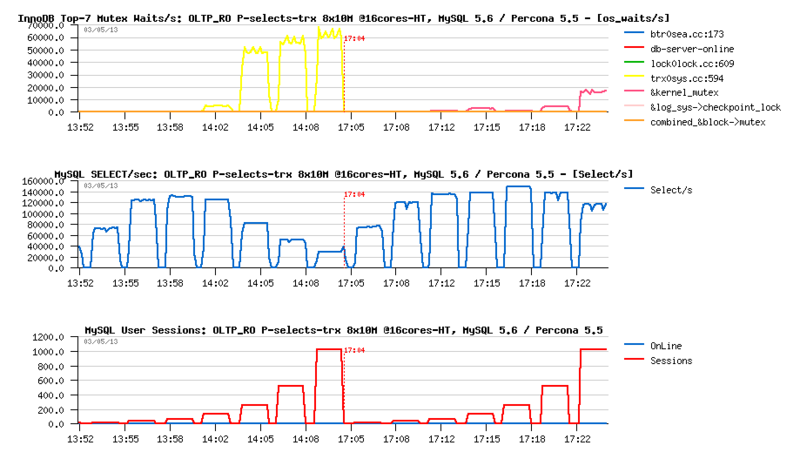 But since 64 concurrent RW users MySQL-5.6 is starting to hit trx_sys mutex contention which is impacting a lot its RW performance..
and since 128 RW users hitting a dramatic regression on RW workload performance..
then a clear benefit of proposed "TRX list" patch by Percona: by lowering trx_sys mutex contention, it's lowering also as the result the lock_sys mutex contention too..
which is finally resulting in a better RW performance while keeping exactly the same RO regression..
however, on this test case we're seeing only a secondary effect of the patch as trx_sys mutex contention is not on the top position.. So far, to "fix" MySQL-5.6 I think we have here two options: backport related to trx_sys mutex (and other) contentions improvements from 5.7, or simply apply a proposed by Percona patch.. (interesting that a very similar "fix" implementation was already tested by InnoDB Team in the past, but was rejected as not giving a complete solution to the problem)..
For sure, a true fix for all these issues will come with MySQL 5.7.. But probably as a "short term" the fix used here by Percona will be just "good enough" for MySQL 5.6 right now?..